Our Front Load Safe Box Is Perfect For The Home, Office, Or Work Place. This Deposit Safe Is The Ideal Cash Drop Safe. 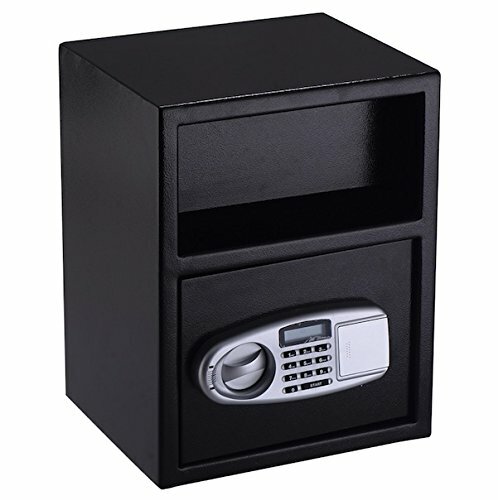 This Safe Is Great For Accepting Coin Bags, Jewelry Paper, Gun And Other Valuable Objects. The Deposit Drawer Is Located At The Front Of The Safe And Works In The Same Way As A Post Office Box Does, Which Will Be Convenient For Putting Your Item In It. 4 X AA Supplied With Batteries And Key Override. And This Safe Box Is Great For Shops ,Restaurants And Personal Use.